Have you ever had something that you HAVE to share with all your family and friends because you know it changes people’s lives? Well, I am jumping for joy because that is exactly how I feel RIGHT NOW and I am so excited to share it with you. Recently, a dear friend and mentor said to me, “With all your years of experience, success and the hundreds of weddings you’ve performed, you could write a great do it yourself vow book. Something that can support couples to create meaningful, unique words on their special day”. What a GENIUS idea (thank you, Dr. Yvonne!)! You know that I’m a great lover of romantic films (YES, The Notebook is one of my faves) and as a 10-year, Award-Winning wedding officiant, I absolutely adore hearing people’s love stories. So, I got to writing and before you know it, I had over 300 vows written! 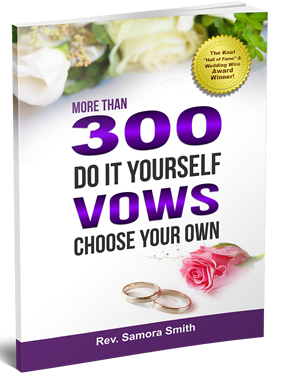 If you are newly engaged, know someone getting married, or want to renew your vows, my “300 DO IT YOURSELF VOWS” book is a wonderful experience. Once you open it, you‘ll keep on reading because it makes you feel so incredibly good. AND it’s a gift that keeps on giving! Everyone knows that for a lasting relationship promises need to be continually created and built upon. For married couples, imagine choosing a “vow-a-day” to say to one another to keep your love alive; a surprise written vow might be even better. Or you can create an anniversary ritual and use this book to pick new vows to say each year on your special day. Isn’t that awesome? For engaged couples, this book provides a constant resource of loving, positive words to put together to say on your wedding day. And, it’s fun! You simply copy and paste your favorite lines and TADA! You have wonderful and meaningful personal vows. Each vow carries a high vibration and the chapters are carefully thought out to align with all the important topics that create a wonderful, lasting marriage. This is a wonderful gift for yourself, for newly engaged couples, bridal showers, and even your parent’s upcoming anniversary! I am beyond excited to share my book with you and I invite you now to click HERE to order your copy (or copies!) today.